The legendary rock band Uriah Heep had undergone many lineup changes since its beginning. 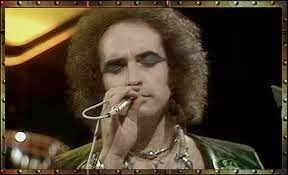 However, in 1976, the band was about to undergo it’s most difficult lineup change—replacing lead singer David Byron. As anyone familiar with rock history knows, replacing a lead singer is the hardest thing a band can do, and very few bands can continue to thrive after a singer is replaced. John Lawton came from singing for two German bands: Lucifer’s Friend and Les Humphries Singers. With the exception of Lucifer’s Friend’s first album, the music was not as hard rock as Uriah Heep. Yet, despite coming from a mostly non-heavy background, John passed the difficult role of becoming Uriah Heep’s lead singer with flying colors. He was accepted by the fans. John was the singer for Heep from 1976–1979. His fans and the band look back on those years very fondly. To this day, one of the songs he co-wrote with guitarist Mick Box, “Free ’n’ Easy,” is still played at encores at Uriah Heep concerts. Yet, those who only focus on John’s Heep years are missing out on some good music as well. 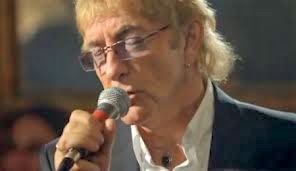 His previous history with Lucifer’s Friend and Les Humphries Singers not only shows why Uriah Heep picked John as their lead singer, but also shows John’s vocal variety with different musical styles. 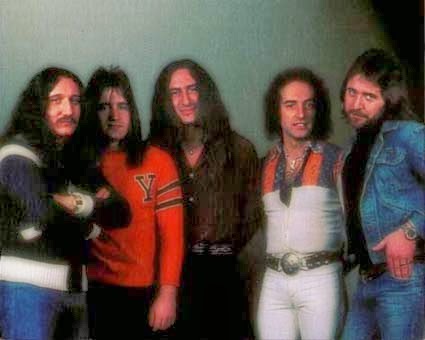 Although Lucifer’s Friend’s debut album is similar to Uriah Heep, the band showcased different types of music genres, such as progressive rock and jazz. In fact, Lucifer’s Friend was known for changing the musical direction with each album, and John was able to sing a variety of genres. Likewise, Les Humphries Singers was comprised of a group of singers with Abba-like harmonies that sang gospel, dance pop, and covered famous pop tunes of the 1970s. While John continued to sing, perform, and make albums after leaving Heep, over the last ten years he found a new occupation as a filmmaker. He has made travel documentaries on Bulgaria. In this candid conversation, we focus on John’s early years with Lucifer’s Friend and Les Humphries Singers. We also discuss the legendary Uriah Heep years. In addition, we look at John’s years after Heep and his new occupation as a filmmaker. I want to thank Billy James of Glass Onyon PR for setting up this interview. But most of all, I want to thank John. Jeff Cramer: All right. So, what encouraged you to start signing? John Lawton: Oh, God, it goes way back, Jeff. I think the early days of childhood and things like that. My parents always played music in the house. My father was a great lover of Hammond organ and Jimmy Smith—people like that—and I grew up listening to all kinds of music like jazz. Mahalia Jackson was a big influence when I was growing up. She used to be on British TV. They used to show her late at night on black-and-white screens, and she was a big influence in my later days of singing, so yeah, that's where it basically started . . . from my childhood. JC: Okay. 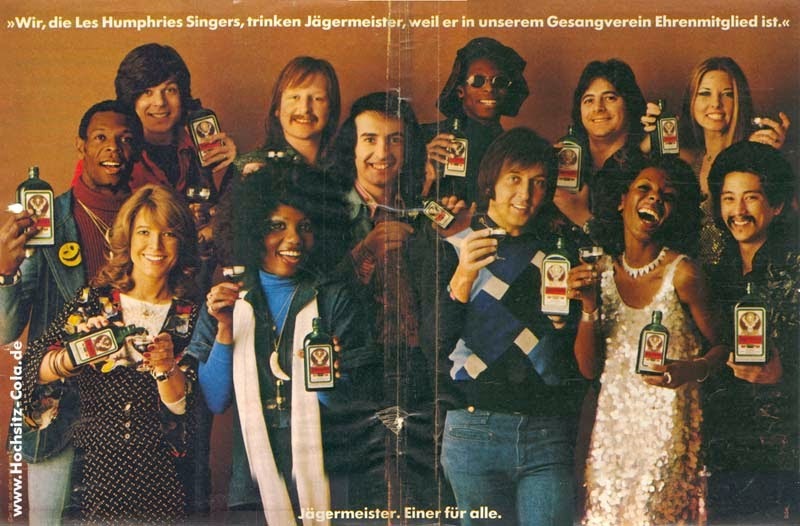 Before Uriah Heep, you were in two groups—Lucifer's Friend and Les Humphries Singers. Both of them were in Germany. How'd you get to Germany to become part of them? JL: I went to Hamburg, Germany, in 1969 for the first time and played well. I came back again in 1970, and the band was made up of some guys from North East England. 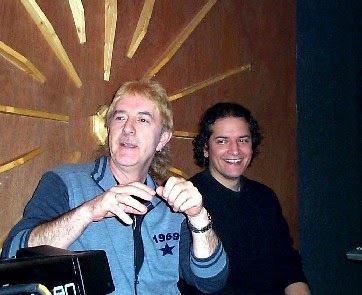 We had Paul Thompson, who is now with Roxy Music on drums, and John Miles was on keyboards. There were a couple of other guys, I think—Vic Malcolm, a guitar player, who later had a band with Geordie, which had Brian Johnson, who is now with AC/DC as a singer. So, it was like a clique up there. We played Hamburg, Germany, a second time in 1970, and I was told by a good friend over there that that's where my future lay and that's where I stayed. I stayed behind in Hamburg. I met my wife in Hamburg, and yeah, that was the incentive. From there, I was introduced to the guys from Lucifer's Friend, who were looking for an English singer in 1971. They played me some stuff, and I liked what they were playing. It was very Black Sabbath but very Hammond-organ orientated and good rock. It was something I'd never heard from a German band before. Yeah, that was the way that happened. [You can hear a great description of this sound John is talking about by clicking here for a live presentation of “Ride the Sky.”] And through them, I got introduced—or I was asked by a guy called Les Humphries who had a gospel choir (they were just becoming very big in Europe at that time)—if I would join them as well. So, I was kind of like, bouncing around between both of them, doing a lot of work with the Les Humphries singers but also with the Lucifer's Friend guys. We got together every now and again and made an album. Lucifer’s Friend’s first album crept into the Billboard charts in the States and we became a bit of a cult band at that time—the first band of the so-called “Kraut rock” to make it outside of Germany, which was very good. JC: Okay. One thing of interest is that Lucifer's Friend and Les Humphries Singers were two different type of genres. Lucifer’s Friend pretty much change genres in each album. The genres ranged from heavy metal to progressive rock. Les Humphries, on the other hand, was a choir that did completely different genres. They did gospel, dance music, and covers of pop tunes. How'd you feel doing all these different musical styles? JL: Well, the situation was that two or three of the guys from Lucifer's Friend were also steady musicians in the James Last Orchestra, which was a big orchestra over in Europe at that time. They had steady jobs with him and they earned their daily bread, their daily money. I guess I earned my daily bread working with the Les Humphries Singers ’cause we toured a lot. We did a lot of work. And that enabled us to get together—the Lucifer's Friend guys and myself—every six months or so and do maybe a couple of gigs and then start writing for an album. I mean, Lucifer's Friend was our main thing. I did my thing with Les Humphries, they did their thing with James Last, but what we all really loved was getting together and doing some Lucifer's Friend work. But you had to live to be able to do that, because you couldn't earn enough money just being Lucifer's Friend at that time. The money just wasn’t there to keep the band going without anything else. We did a lot of studio work for other people as well—singing sessions and stuff like that—just to keep the money rolling so we could keep Lucifer's Friend going. JC: Uh-huh. As I mentioned earlier, each Lucifer Friend album changed very significantly. Was that something that was agreed by the band in general? JL: No. With the first album, the tracks were already written apart from “Ride the Sky,” which turned out to be the single. The tracks were already written, and a lot of the lyrics were already being done before they approached me. I got together with Peter Hesslein, our guitar player, and we wrote “Ride the Sky” together and some of the other lyrics on the album. But it was set in the way it was anyway. There were no set direction with the albums after that. JC: Right. Banquet is an interesting one because the song are longer. For instance, the opening number, “Spanish Galleon,” is eleven minutes long. The album before Banquet, I’m Just A Rock ’n’ Roll Singer, had much shorter songs. JL: I think somewhere along the line, you look at what you've written previously and everything seems to be all elongated with instrumental passages and very progressive and things like that. And sometimes, you look and say, “Well, you know, maybe we should look into something a little bit more commercial.” That's why I'm Just a Rock ’n’ Roll Singer turned out to be a little bit more like that. Not intentionally, I don't think. We just had it in our minds that we should be thinking something along the lines of a little bit more commercial. Not pop, but commercial in that respect. And I think it turned out that way. And then, of course, you go to the other extreme where everybody's getting the jazz as rock influence and you get Banquet coming out of that, you know. JC: Yeah. Lucifer's Friend reminds me of this Texas band called Bloodrock. I don't know if you've ever heard of that group or not. JL: I've heard the name, but I can't say I'm familiar with it. JC: Bloodrock had a name like Lucifer's Friend that indicated they were a heavy metal band. The band did start off heavy, but like Lucifer’s Friend, they were doing jazz-oriented stuff at the ending of their career . JL: Yeah. I think over the years your musical tastes differ when you listen to other kinds of music. I think that when the guys put together Lucifer's Friend’s debut album, they were listening purely to Black Sabbath—that kind of riff-orientated thing—and then I think as the years go by, other bands start to influence you. I know John McLaughlin was a big influence on the guitar player, Peter Hesslein. I think that's where a lot of this thinking came from after that. JC: Yes, one other thing I want to say is did you ever think that the group name would confuse people on what the band really sounded like? JC: Yeah, yeah. The Satanic way. Even though it seems to match with the first album. I mean, there is a song on there called “Lucifer’s Friend.” But on the later albums, did you ever think of changing the group name? ’Cause it left people thinking . . .
JL: Yeah, I know what you mean. I think the problem was the guys themselves had come across that name. That's what they wanted because they were thinking along the lines of Sabbath, the Satanic thinking. And then, of course, once you put an album out, people start listening to it and the name is out there, and people associate certain tracks with Lucifer's Friend. The name is very difficult to change after that. And I don't think really we thought anything more about it because by that time, the name Lucifer's Friend had kind of been established in certain areas of music. To change it then would have been a little bit crazy, I think. We had to stick with it. And I don't think really, we thought any more about it. That was the name of the band and that's it, you know? JC: Yep. At the same time, you manage to have a hit where you take the lead vocal on “Mama Loo” for Les Humphries Singers. JC: All right. How did you get the call from Uriah Heep, then? JL: Well, strangely enough, there were some good friends of mine over in the UK—a band called Mud. I don't know if you've heard them. They were pretty big in the 70s over here. They had a lot of hits and I was quite friendly with them. Their road crew had a tape cassette of my work with Lucifer's Friend. And they knew the guys, the road crew, from Uriah Heep because you meet up on the road—you meet up and play just on the road, burger joints and stuff like that. And they knew that Uriah Heep was looking for a singer to replace David Byron, and Dave Mount [Mud’s drummer], for some reason, handed the cassette over and said, “Listen to this guy. You might not know him, but he might be what you're looking for.” They obviously had a listen to it and the next thing I knew, I was getting a phone call from Ken Hensley asking me to come over to London. They'd heard the tracks and if I was interested, I might actually come over and give it a go, you know? Which I did. The road crew held up cards like they used to do in ice-skating, where they held up sixes and things like that. I got a load of sixes from their road crew, so that's how I got the job. JC: ; How did it feel, because at this point, you were now in a very big band and you were also replacing the singer, which is the hardest to replace. Audiences may not know if a guitarist or drummer is replaced, but they do know when a singer is replaced. JL: I didn't think too much about it really because to be quite honest, I didn't know enough about Uriah Heep before I joined. After I got the phone call from Ken, I basically had to go out and buy the album, The Best of Uriah Heep, to familiarize myself with the music. And so I didn't think too much about the fact that I was replacing somebody like David Byron. It only probably happened in the first couple of months really of joining the band where the press were kind of like, “John Lawton who? And Lucifer's Friend who? And Les Humphries who?” That kind of thing. JC: And I also know Ian Hunter did, too. JL: Yeah. A couple of big names. But they didn't get it. So, after we did a few gigs together, I started to notice people in the audience were getting used to the fact that I was replacing David. But I really didn't think too much about it. JC: You started off with Firefly, which was a little smoother than the last Byron album, High and Mighty. JC: Yes. It helps to start off with a really good album. ’Cause fans are gonna be a little more harsher when they have a new singer and you get one chance to make an impression with them. JL: Yes. Oh, yeah. I also think that the band was kind of softening. At that particular time, they were also softening their approach to their writing as well. I mean, consequently, Ken Hensley was writing a majority of the material anyway, so he was kind of softening his approach to what he was writing and looking at more of a softer side to the band, I think. And not to be as progressive as they were in previous albums. JC: Yes. On the next album, Innocent Victim, you wrote a very heavy track, which happens to be—and I'm not saying this ’cause you co-wrote that track with Mick Box—one of my favorite Heep tracks: “Free ’n’ Easy.” It’s jarring when you hear it on Innocent Victim because Ken is still doing softer stuff. JL: Yeah. It's something I came up with. I came up with a riff at home and I put down some lyrics and things like that and took it to the guys, played it, and mixed it all out. I thought we could put a couple of changes in there, which we did—change it very slightly from what I'd originally written in my own naïve way, ’cause I’m not a guitar player or anything like that. And I managed to put this track together. But I made a couple of changes in there, and to be quite honest with you, Uriah Heep's still playing it today as one of their encore tracks. When they tour, it's one of their encore tracks at the end of the gig, and I'm still doing it, and people still love to hear it live so we keep playing it. And he just played the opening bars and sang it a bit and we all said, “Yeah, why not? It's a good track to put in there. It sounds commercial. We could have something good here.” So, we recorded it. JL: Yeah. Oh, yeah. Big song. Lee actually played that to me in a Holiday Inn in the hotel bar. There was a piano. There was nobody else in the bar—just him and myself and our wives—and he just played it to me as basically as he could, and I thought straight way, “It's a good song. We should certainly record this.” And we did. And it was terrific. And I'm glad we did. JC: Yes. I've even played the song for a few people who aren't even familiar with Heep, and it goes down pretty well. At that time . . . now, I understand there was an album that was going to be recorded with Rolling Stones producer Jimmy Miller. JL: After Fallen Angel, we started to record some tracks. I had written some and Trevor Bolder, bless him, had written some and Ken had come up with a few things. So, consequently, everybody now was kind of writing. It wasn't just necessarily Ken Hensley doing most of the writing. Everybody was contributing tracks to this new album. We got Jimmy Miller in. The idea was to get a producer in who had nothing to do with the band at all, because up until then, it had all been Gerry Bron. So, the idea was to get somebody in, somebody internationally well-known to produce this last album. The name Jimmy Miller came up because he has a Rolling Stones influence and things like that. It turned out to be a bit of a disaster. So, it was agreed halfway through that he shouldn't carry on and we reverted back to Gerry Bron. I think we recorded fourteen tracks all together, things that were kind of a little bit off the wall. I had three or four tracks on there, which were poppy but at the same time a little riffy, things like that. And everybody kind of contributed. But it came down to the fact that nobody seemed to be able to settle on what tracks we should actually go ahead and complete. And then, of course, toward the end of that recording session, I left the band. But the tracks are still there. Plenty of people have bootlegs of it. It's called Eight Miles and things like that. It has various names. There are bootlegs, but I think it should really be completed. It would be nice for the likes of Mick Box to go in and complete it. I would like to go in and redo the vocals and all kinds of things just to have a one-off to commemorate the end of that particular year. JL: But I don't think Mick Box is too keen on doing that. Of course, Uriah Heep moved along a lot. I don't think Ken Hensley's keen on doing it. Lee Kerslake would possibly do it. Well, Trevor isn't around anymore unfortunately, so I think you would need all the members—apart from Trevor, of course—who want to do that, and I don't think the persuasion is there at the moment. JC: What are your memories on the late Trevor Bolder? JL: Oh, he was a lovely guy. I know everybody says when somebody leaves this earth, “Oh, what a nice guy he was,” but he was a genuinely down-to-earth guy, an absolutely, fantastic bass player. We both joined the band around the same time. So, we both got into Uriah Heep at the same time, both strange to what was going on, but he was an excellent bass player then. I knew him from his David Bowie days; I’d never actually knew him personally, but I’d seen his work with Bowie and the Spiders, and he just progressed from that until the end of his life with Heep. He was just one of the best around and a genuinely nice, nice guy. He was very down to earth. His humor was very dry, but he was just exceptional and an exceptionally good song writer as well. He wrote some terrific stuff toward the end, and I know there were a few things in the pipeline that he had for this last album, which Heep are in the process of recording now. I think he's a great loss – a great loss to the music business. JC: ; What brought on your reason to leave Uriah Heep? JL: To be quite honest with you, it was a combination of things. Ken Hensley and I weren't getting on well at all and he'll admit to it. At that particular time, he had his demons—drug demons and things like that. And he's the first to admit that. Musically, we weren't gelling at all. I think there were signs when we were recording Eight Miles that we weren't on the same wavelength musically at all. It's all very well if somebody brings a song along. At least if everybody tries it, you try to work it out, and if it doesn't work, then you leave it. But we were getting to the stage where nobody was really wanting to try anything out except Ken maybe. So, there was a lot of that kind of thing going on. Musical differences played a large part of it, plus the fact that I was taking my wife on the road, which we always did. We always travelled together, and there was kind of a bit of a thorn in the guys' side because they're old hands at rock ’n’ roll and things like that; they had various ladies in various ports, so to speak. And it became a bit of a problem. And of course their wives were saying to them, “Well, if John Lawton's wife can go, why can't I travel with?” I think they were the old school, you know, where you didn't have wives if you were a rock star. You didn't have this, you didn't have—you were purely a single guy. So, it was a bit of that and a bit of musical discrepancy going on, and we both really agreed that we should come to the end of our ways. It was better for them to go their way and I should go my way, and that's it. Having said that, we are still good friends. I stood in for Bernie Shaw, the present singer of Heep, this past year. He’s had some problems, and I stood in for him for a European tour and we've done gigs together. Mick and I still e-mail a lot and I'm still friends with Ken. We had the Hensley Lawton Band in 2000. We recorded an album. So, it's not as if we totally ignore each other. That's not the case. Simply, we needed to go our separate ways and I think that's what happened. JC: I also saw The Magician’s Birthday concert where you and Ken reunited with Trevor, Mick, and Lee and joined with the new guys, Bernie and Phil. JL: Yeah. We're good friends. I always say, “Once you join the Heep family, you never leave, regardless.” And I'm always there for them if they need help. I'll always step in. And if I need help, Mick and the guys are the first ones to step up and say, “Yeah, we'll come and do this for you.” We can't argue about that at all. It's a good way to work, I think. JC: Yeah. So, I understand right after you left Heep, there was a solo album that was pretty much with the Lucifer's Friend guys and then you did one last Lucifer's Friend's album. JL: Yeah. 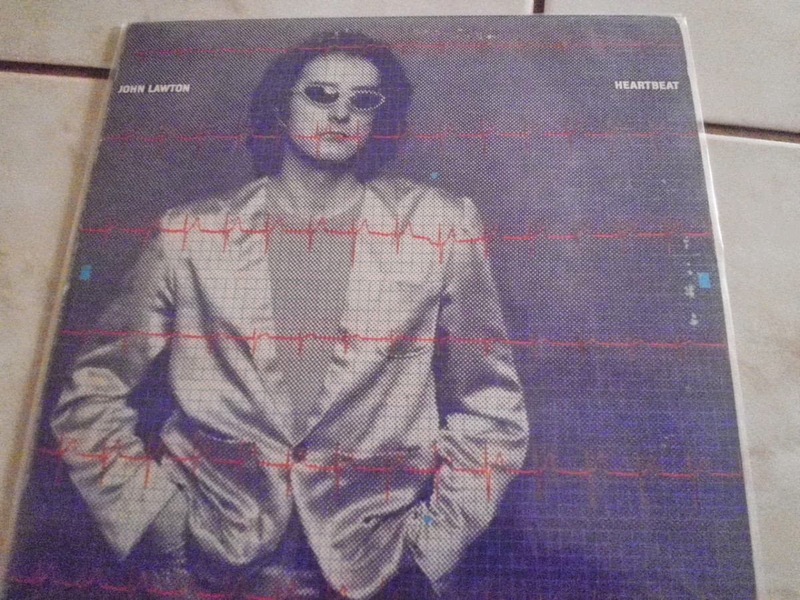 I did an album called Heartbeat in 1981, and it was Peter Hesslein, the guitar player from Lucifer's Friend, and myself. We did most of the music and the rest of the guys who played on the album were the Lucifer's Friend guys. We got a drummer in called Curt Cress who was a big jazz-influenced drummer in Germany, a big name. He came and did the drums. He used to play with Klaus Doldinger’s Passport, and I think he did a stint with Frank Zappa as well. He came in and did the drumming. I got a release in the States through RCA. It was a good album. Very poppy. But it was slightly different than Lucifer's Friend stuff. After that, I worked with a German band called Zar who hailed from the south of Germany. They asked me to come over and if I would produce their first album, which I said I would. Unfortunately, the singer at that time was having some problems and he couldn't really sing the tracks that the guys had written so I said, “Well, look, I'll demo them for you until you get a new singer.” And they liked the demo so they asked me if I would do the proper singing, which I did, and it resulted in two albums with that band Zar. So, I've always been kind of in the studio somewhere. JC: What else have you done after Zar? JL: I did a lot of session work after Zar for various other people, but then the session work was getting to me and I didn't particularly like the session work. It was a bit boring. But I got together some local guys I knew around the London area and we put together a band called GunHill. We went off and just did some gigs just for the sheer hell of it. They weren’t the best musicians in the world, but we had good fun and we played a lot of stuff. We played some Heep songs and some Whitesnake, and all kinds of things just to get out there and get an audience reaction to it, and it just really went from there. We started playing in Europe and it got better and better and better. We got a few changes in personnel. We got a new guitarist who was better than the old guy, so to speak. It just went very well. JC: So, is that your current thing, GunHill? No, no, no. That band moved on to become the John Lawton Band. We had an album out, and we added a couple of studio albums with the bass player that I worked with—a guy called Steve Dunning. We worked for Classic Rock Productions based here in London. We had a DVD out, a CD, and all those kind of things. I was just doing all this work and things just kept coming along. And it got more and more sudden, and suddenly I found myself back on tour again. I was asked to be special guest with Heep, and the Hensley Lawton Band came along. From there, I progressed from that into working a lot in Bulgaria. I've been working in Bulgaria for the last ten years, from doing live concerts over there, to directing and presenting travel documentaries. JC: Oh, travel documentaries. That's interesting. JL: Yeah. I've done nineteen-and-a-half hour programs about Bulgaria. I'm presenting and directing, and then I've had a part in a Bulgarian cinema movie which did very well. Mick Box from Uriah Heep had a cameo role in that one and that did very well. So, I've been putting my hands in various boxes to see what comes out. It's progressed from that to the present day where I'm working. I work a lot in Bulgaria, that's very true. I'm working with a guy called Milen Vrabevsky, and the last year—eighteen months ago now—we recorded an album called The Power of Mind. We've just completed the second album in this series called My Kind of Loving, and we have Simon Phillips from Toto on the drums. JC: Oh, yes, Simon’s a great drummer. JL: Yeah. And Joseph Williams from Toto has sung four tracks on it. So, that's completed. I think release date is set for the middle of May. JL: Yeah. So, that's where we are at the present day. JC: Okay. Let’s go back into filmmaking. How did you get into it? JL: I was approached by a Bulgarian guy called Valeri Simeonov. He has a TV station out there called Skat TV. It's a Bulgarian TV station. He saw these little short movie clips on my John Lawton website that we would make when we were on tour somewhere. He asked me, “Would you like to do this kind of thing for real?” And I said, “Yeah, okay.” And he outlined what he wanted to do. Basically, they’re commissioned by the head honcho in Bulgaria—the mayor and his counselors—and they’ve commissioned a film about their particular area and the history of it up until the present day. So, I tried it and it worked out really well. It’s called John Lawton Presents [You can view one of the travel documentaries by clicking here.]. Like I said, we've done nineteen-and-a-half hour programs about Bulgaria, so it's worked really well. And they're very interesting to do. I'm learning a lot from doing them about that particular part of the world ’cause not many people know a lot about Bulgaria. People know about Russia, Ukraine, Turkey, etc., but people are not aware of the history of this particular country and things like that. So, it's very interesting for me to make and I get a lot out of it. Right now, I will be doing some more of these movies/documentaries this coming year. I’m hoping to do another two. I have more concerts coming up. I do what's called the July Morning Festival every year in Bulgaria. It celebrates the first of July. It represents, through the Bulgarian people, their freedom from the times. It’s on a cliff overlooking the Black Sea at 5:30 in the morning. As the sun rises, we go on stage and open up the set with the song the Uriah Heep song, “July Morning,” and it's the people's way of expressing their freedom. When we first started doing it ten years ago, there were a couple of thousand people there. And we've got it up to 10,000. I think we had 12,000 people there last year at 5:30 a.m., and they come the evening before. They pitch their tents and all kinds of things. And they're all there, at 5:30 a.m. when the sun rises, and we kick off with “July Morning” and follow with a full set. It's a feeling. I can't tell you. It's just a great feeling. JC: I love going to concerts, but I don’t want to get out of bed at 5:30 a.m. for anything. How does one get ready for a concert at 5:30 in the morning? JL: It's tradition though. That's the thing. I've never heard of it anywhere else in the world, but it's the specialty for Bulgarians that they celebrates their freedom from the days of oppression with the first of July, and it's just a great feeling. The first time I ever did it, I looked at my wife and said, “Can you tell me why I'm getting up at 4:30 in the morning to do a gig at 5:30 in the morning?” But once I'd done it, I realized, “This is why I'm doing it. Because it's just great.” It's a great feeling. JC: Yeah, then that's the sign of the power of music. Even though you weren't in Heep when they recorded “July Morning,” but nevertheless, you were a singer of Heep and the fans consider you an essential part of Heep history. 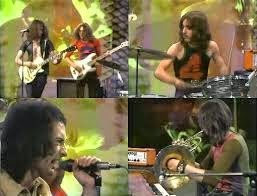 JL: I was never aware of how much of an influence Uriah Heep’s music was to the people in the Eastern Bloc, not only in Bulgaria but also in Romania, what used to be Yugoslavia, and in the Ukraine all the way up to Russia. Uriah Heep's music at that time was a breakthrough—apart from the Beatles, of course and things like that—but the music of Uriah Heep was the breakthrough thing for them. It was really the first kind of westernized music that they listened to via their bootlegs, which were hastily hidden from the secret police if anybody came knocking, under the table. And I've met so many people—all the generations—who've said to me, “You have no idea how much that music meant to us.” And that's why a song like “Come Back to Me” is still very popular over there because they love all that kind of music. They love “Free Me,” “Lady in Black,” and other songs like that. And when you see them singing along, it sometimes brings the older generation to tears. They really respect Uriah Heep’s songs over there. I've been over there with Mick Box from Uriah—we've done a couple of gigs together with Bulgarian musicians and the band is greatly loved over there and I think that's a great thing. JC: Yeah. That's a great thing, especially the williness to listen to something even though it was illegal in their country. JL: Yeah. It's a good thing and I think they appreciate Uriah Heep members coming down to play this music. I was the first ever to perform a rock concert in a specific area of Bulgaria at a place called Kavarna, which is in the north, on the Romanian border. I did the first ever rock concert there. I'm not blowing my own trumpet, but since then, every year in June and July, Kavarna has some of the biggest rock names over there. Last year, Deep Purple was there. Whitesnake's been over there. Robert Plant's been there. Alice Cooper—some of the biggest names in rock have played the Kavarna Rock Festival. I'm kind of proud that I was one of the first ones to actually go and do it. JC: Yes, yes. Good. Given all this interesting history you’ve had as a singer, what advice would you give to someone who is interested in singing? What would you recommend? JL: First of all, I would recommend trying to find out whether you can sing. There are so many people who have said to me, “I'm having singing lessons.” And I'm thinking, “Well, hang on a minute, if you can't sing, you can't hold a note, or you can’t hold a melody, then nobody can teach you that.” If it's not in there, it's not in there. A good singing teacher will teach you how to breathe: how to use breathing techniques for the difference in falsetto and normal and from the chest, etc. A good singing teacher will do that for you. But so many people can’t hold a melody and can’t sing along. So many people sing along to Karaoke and think they're great and they're not. They can't hold a melody even they know the song backward. I've been asked this question many times—if you're good at what you do, just go out and sing live as much as you can. Because there's nothing like singing to people regardless of whether it's two people, ten people, twenty people, two hundred . . . whatever. I mean, I first started out doing small clubs in the north of England. They’re called “working men's clubs” where the workmen would go after they'd finish their days’ work. They would go to the bar and have a few pints of beer and talk with their friends. I've played at gigs where there's maybe four or five guys in there with a couple of dogs, and in between songs, they would play Bingo, and then you'd come on and sing some songs, so I know what it's like to play to very few people. But once you can do that and make them listen to you, then you know you're on the right path. But the best way to establish it is to get out there and sing live so somebody hear it. These days, YouTube is the best way for people to get recognition. So many artists these days have gotten their recognition through YouTube, especially bands like the Arctic Monkeys and people like that. People have seen them on YouTube and say, “Hey, you gotta see this band,” and it's word of mouth that's passed down. So, YouTube is a great way of doing it. Today, the technical ability to record stuff in your own living room, in your own bedroom with a computer, is limitless so for anybody out there, if you're just starting out, try every possible way to get your voice out and be heard. That's the best way to do it. such a great in-depth interview with John. thanks! Thanks a lot for a great interview with John Lawton. Would really really love to hear the full 8 Miles session songs. A release would be super!